We are so excited to announce that our blog has a new and wonderful domain name!! 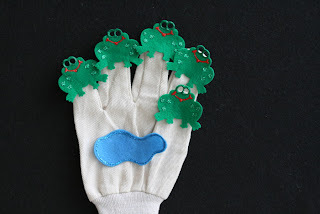 You can now reach us here at http://www.feltstories.com/!! Of course you can still reach us at our blogspot address too!! 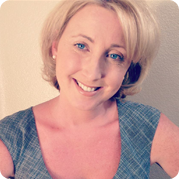 We have a new wonderful web designer who is making some new changes to our blog! Please be patient with us as we add some new wonderful features for all our wonderful readers!! Help Subway distribute 142,500 $2 SUBWAY gift cards! To claim your FREE $2 gift card, please complete the form attached to this link using a valid California mailing address. If you are one of the first 142,500 valid requests they receive, they'll send you a $2 Gift Card. They are distributing 142,500 SUBWAY® gift cards as part of a settlement agreement with the State of California due to claims made that advertised specials were not honored in certain locations. Be sure you tell your friends how they can request a card of their own. Please allow 10-12 weeks for your card to arrive. Limit one Gift Card claim per California household. Get help getting your child to sleep now!! This is an amazing FREE Opportunity for you and your children!! When your child does not sleep, neither do you! Parents Connect has teamed up with pediatrician and sleep expert Dr. Marc Weissbluth and they are offering a FREE kids sleep training boot camp!! Over the next four weeks, Dr. Weissbluth will give you tricks and tips to help get your child to sleep through the night. You'll also have the chance to ask him direct all your questions!!! 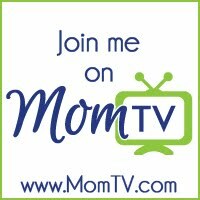 Log-in and join now to help get any advice you might need. Free Pancakes at IHOP! February 24th from 7:00am- 10:00pm!! 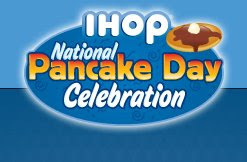 Join IHOP as they celebrate National Pancake day!! They'll give you one free short stack (three) of their famous buttermilk pancakes. All they ask is that you consider making a donation to your local children's hospital through the Children's miracle network, or other local charities! With Tyler suffering from Neutropenia, we spend a lot of time at our Children's hospital....so we cannot wait to help support this great cause!! My Girlfriends and I had a super fun time this weekend at a Risotto cooking class we took at a local restaurant in Newport Beach. We had so much learning how to try and make this very difficult and delicious food! For all of you who watch the show "Hell's Kitchen" I am sure that you know how popular this dish is on their cooking show....and I could not wait to learn how! We learned how to make three wonderfully Delicious Risotto's! 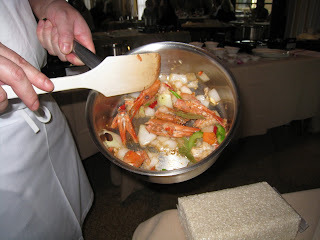 We learned how to make a chicken, vegetable and seafood! When we were all done we enjoyed eating our delicious food and enjoying each other's company! My favorite!! The vegetable!! It was delicious!! Here is a link to the closest version of the vegetable Risotto! We hope you have fun trying to make this delicious Italian staple food! It is also a favorite with children!! Seafood Risotto...Check out those Fish Eyes!! Enjoying the Delicious Chicken Risotto!! 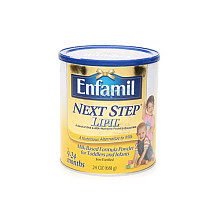 Free Enfamil Next Step with Lipil Coupons!! We have five coupon/checks for Enfamil Next Step with Lipil! Each Coupon is for $3.00 off for a total savings of $15.00. They expire on April 30, 2009. Please comment below if you want one of the coupons! We have 5 total!! Please leave your email address so we can contact you for a mailing address!! 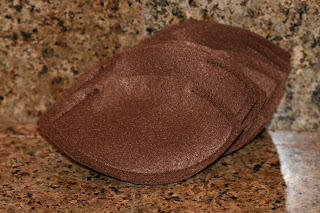 These are first come first serve...so make sure and blog right away if you need one!! 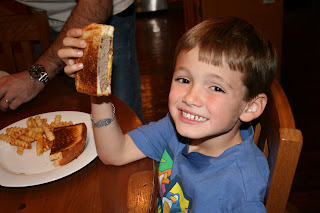 With our most favorite local burger joint going out of business it has put me on the hunt for the best patty melt recipe! We go to Church on most Saturday nights and enjoy a nice burger out after service. We are so sad to see our favorite burger joint go! I am going to be trying lots of recipes until I find the perfect one!! I made this recipe last night and it was yummy! 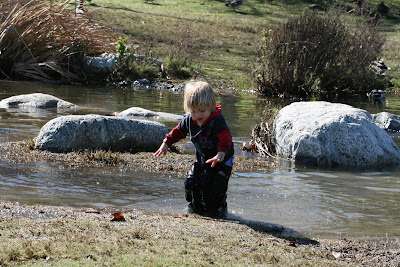 The kids enjoyed it a lot and seemed much healthier than the one's in the restaurants! The best part....super fast and easy dinner!! Give it a try! Enjoy!! In a bowl mix beef, egg, grated onion, garlic powder, salt and pepper. Form into patties. 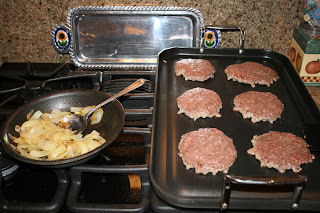 On the same skillet at six slices of bread, butter side down. 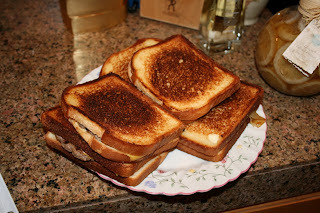 Top each with slice of cheese, burger and onions if desired. Top with another piece of bread butter side out. These are my favorite pictures of the week! 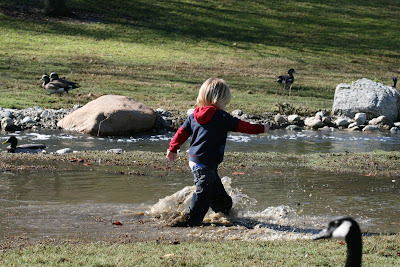 I took Ella and Tyler to feed the ducks at our local regional park, and Tyler could not help but jump into the yucky bird poop water! 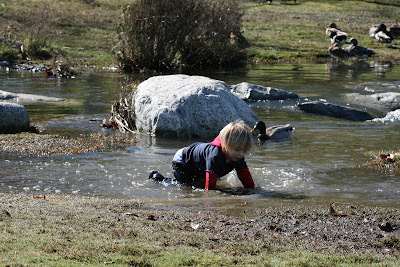 When he came out of the water he lost his pants! 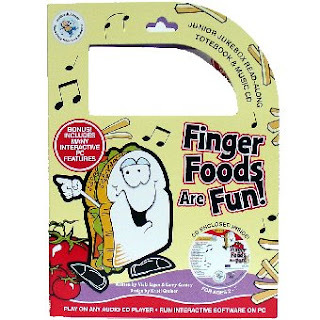 Finger Foods Are Fun!! Music Giveaway!! This is one of my kids favorite Music Cd's!! We listen to this almost everyday while I am preparing dinner. It has some great songs that encourage healthy eating and my favorite is the song that encourages the kids to help set the table! I cannot say enough wonderful things about this music CD set. The company who makes these encourages literacy in a lot of their products! That makes them a best seller for me! The Totebook comes with a Read-Along CD Storybook, filled with colorful characters hilariously brought to life by animated storytellers. Bonus Computer features, where you can play the CD in your computer to enjoy the Read-Along Story, Interactive Coloring Book and Junior Jukebox audio player!! These are also guaranteed child safe! They have sewn-in pages and Non-toxic ink and glue!! Recommended for Children ages 2-7. Do you like Cookies and Milk? Just enter a comment below! Please make sure and leave your email address to be notified if you win!! Follow our blog! We love our followers!! Blog or tweet about our giveaway!! Andrew & Ella Kissing in the Turks and Caicos! The kids and I love Valentine's Day and this year we set out to make our Valentine's different and with a little more love in them! 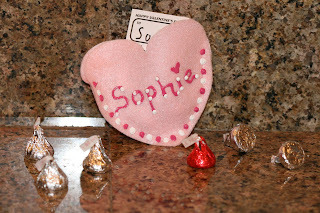 Here are some pictures of how we made together felt Valentine's and Candy bags!! 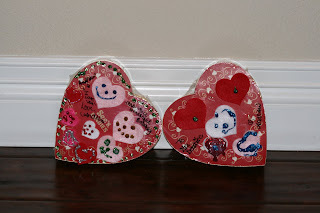 The kids decorated their traditional See's Candy boxes with Felt hearts, Glitter glue and puffy paint! They had so much fun making them personalized!! 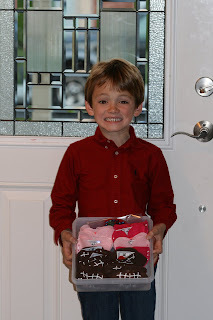 Andrew this morning with all his finished Valentines!! Our Finished girl Valentines! Filled with the traditional store bought Valentine and lots of kisses!! Our Finished Boy Valentine's!! 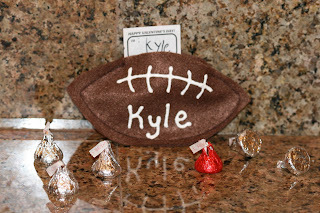 Andrew loves football and wanted to create football Valentine's for all this "boy" friends! I sewed up the sides of the footballs and hearts leaving a small opening in the top! 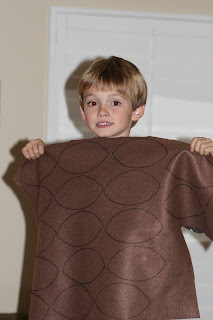 The kids helped me make a football pattern. Together we traced and cut out all the footballs!! This was truly our funnest year making Valentine's together! Plus they turned out so super cute!! Here are days Twelve, Thirteen, Fourteen and Fifteen of our "love Calendar" where my children are saving money for a Goat or Dairy Animal for a family in need. We hope you are enjoying participating with us! Day Fourteen: Be thankful that you have parents and put in a quarter for each one! Day Fifteen: Count the days in one week and add a penny for each day!! After a trip to See's Candy to get all my Valentine's Day Candy...Tyler enjoyed a chocolate Lollipop! 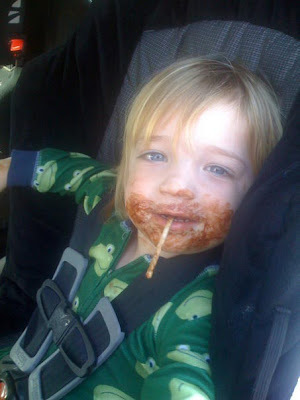 Who knew a lollipop could be so messy!! When your child says, "Watch me!....Watch!" Clap and cheer and say, "Great job!" Give your child a hug and say, "I love you" every day! Show your child where you've kept for a long time a special card or picture he or she has given you. Snuggle in beg together as you tell a good-night story. Have a family worship time after a meal by singing, praying and reading Scripture together. Make a photo gallery somewhere in your home, and display your children's school pictures from each year. Talk with your child about what you're learning personally about Jesus Christ. 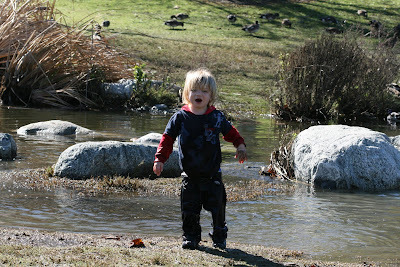 When your child talks to you, put down what you're doing and look into his or her eyes. Maintain an encouraging expression and make your presence positive. Start praying now for the spouses your children will have someday. Pray that their marriages will be strong and Christ-centered! 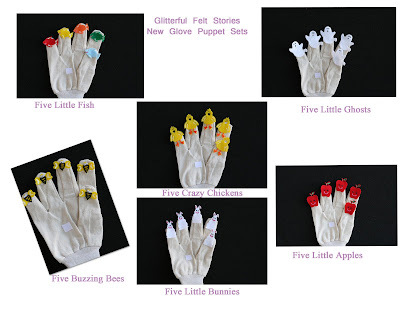 We have gotten such an overwhelming response to our new Glove Puppet sets that we have added more new sets and we are running an exciting new promotion!! 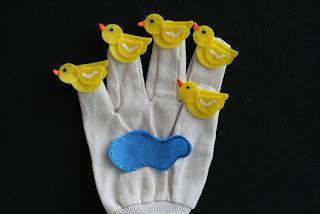 Currently from February 6th-February 28th you will receive one free Glove Puppet with the purchase of four or more Glove Puppet Felt sets!! We are going away to enjoy some of our new snow in the local mountains....so I am posting the next three days of the love calendar! Here are days Six, Seven and Eight of our "love Calendar" where my children are saving money for a Goat or Dairy Animal for a family in need. We hope you are enjoying participating with us! Day Six: Count the letters in your name and add a penny for each one! Day Seven: Count the number of cans in your pantry and put in one penny for each one! Day Eight: Add a dime for each family member that you have and love so dearly!! Today is the fifth day of our "love Calendar" where my children are saving money for a Goat or Dairy Animal for a family in need. We hope you are enjoying participating with us! Today as we counted the shoes in our closets. We thought of all the kids in the world that do not have any shoes. We put money into the bank for every pair of shoes we have. So far our children have saved $10.00 towards our $70.00 goal!! Today is the fourth day of our "love Calendar" where my children are saving money for a Goat or Dairy Animal for a family in need. We hope you are enjoying participating with us! So far our children have saved $5.00 towards our $70.00 goal!! Today I got an email that I wanted to share with all my reader! I have a front loader washer and after reading this I attached a Velcro safety latch onto it. "I thought I should share this with you mommies...and please pass this info along. This may be on the news as well. My mom just called...she works in an orthopedic surgeons office. Apparently a little girl about 4 years old was treated for a broken foot...but she is also severely brain damaged. She was playing with her little 1 -1/2 year old brother and she climbed inside of a front loading washing machine. The little brother closed her in and pushed some buttons...this locked her inside and she was stuck for too long. Please take caution with front loading machines. I never would have even thought about this.so sad." Today is the third day of our "love Calendar" where my children are saving money for a Goat or Dairy Animal for a family in need. We hope you are enjoying participating with us! So far our children have saved $3.00 towards our $70.00 goal!! Today is the second day of our "love Calendar" where my children are saving money for a Goat or Dairy Animal for a family in need. We hope you are enjoying participating with us! Today at dinner we talked about how we are thankful for our friends. We also talked about all the wonderful things we love about our friends! The children put a gift into their bank for all their hungry friends around the world! So far our children have saved $2.00 towards our $70.00 goal!! This month we are going to be saving our money to help buy a Goat or Dairy Animal for a family who is in need. From Latin America to Africa to Asia, Samaritan's Purse has furnished thousands of goats and other dairy animals to assist poor communities. 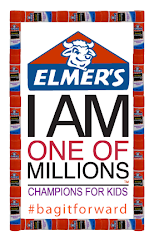 Just $70 can help provide a family with a steady supply of fresh milk. Every night at dinner time the children, my husband and I are going to tell each other what we are thankful for and put money into the bank for our blessings! We will also be using a "love" calendar to help us save! If you would like to participate we will blog daily what we are doing on our "love" calendar to help reach our goal!! "Dear friends, let us love one another"
Our Family is hoping to save up the $70.00 by the end of the month to help purchase a dairy animal! Today my children went to Sunday school and told their class how they can help hungry children. Andrew said, "I am going to collect all my veggies and mail them in an envelope." Ella said, "She is going to send them some seeds from her watermelon, so they can grow some yummy watermelon." The kids then put .50 into the bank towards their cow or goat!